I tried for months to find an acceptable way to serve sweet potatoes for dinner. I like them just about any way, but my husband and kids did not. My husband's Aunt has an amazing garden and is great with vegetables. 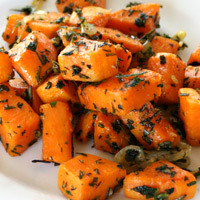 She sauteed some sweet potatoes with onion and fresh herbs and then roasted them in the oven. I followed her method: now they all love them! 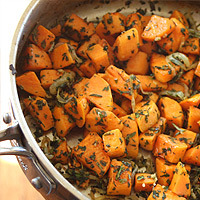 This recipe is also great with red or gold potatoes, carrots, or parsnips. Follow the same instructions. To add zuchinni or other quicker cooking vegetables, sautee the onion, herbs, and garlic as directed, then toss with the vegetables, and roast 5-15 minutes until cooked but still firm. Heat oven to 450. Heat a large skillet over medium heat. Peel and cube the sweet potato. 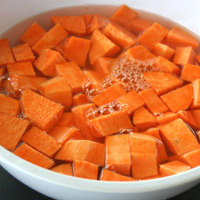 Place in a bowl and rinse well, then pat dry. Toss with 1 t olive oil and the salt. 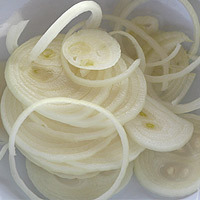 Slice onion into thin rings. The potatoes can sit in a bowl of cold water refrigerated up to one day. Rinsing potatoes removes the excess starch that comes when cutting them. This helps keep the outside crisp, instead of mushy while cooking. Drying the potatoes allows the oil to coat them so they won't stick to the pan. A mandolin is the easiest way to get even onion ring slices. I got mine for $10 at Wal-Mart. I've had it for 3 years now, and it still works pretty well. 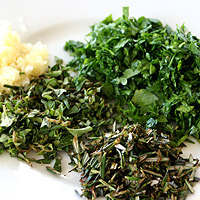 Rinse, pat dry, and remove leaves from the thyme, rosemary, and parsley stems. Chop well. Crush garlic. Set all aside. Add the remaining olive oil to the heated skillet. Add the onion and reduce heat to low/medium. Cook until it softens about 5 minutes. Add the potatoes, and turn the heat to medium/high. 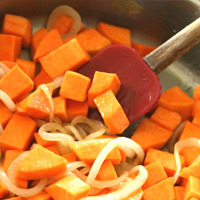 Stir frequently, and cook 2-3 minutes. Reduce heat to medium, and add the garlic and fresh herbs. Stir well, and cook 1-2 minutes. Transfer pan to the heated oven. Roast 5-15 minutes until the potatoes are softened. Serve hot. The time here varies greatly depending on the size of the cubed potatoes. Other factors are the cooking time and temperature on the stove. Follow the instructions for the cooking temperature of the onions. Onions that are cooked on high will brown and taste much different than the near carmelized onions here. Follow the instructions for the cooking temperatures for the garlic and herbs. Overcooked garlic tastes bitter. Overcooked fresh herbs loose their fresh taste. 1. Heat oven to 450. Heat a large skillet over medium heat. Peel and cube the sweet potato. Place in a (1)bowl and (2)rinse well, then pat (3)dry. Toss with 1 t olive oil and the salt. 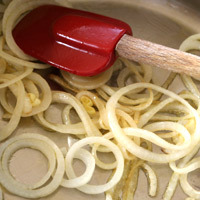 Slice onion into thin (4)rings. 2. Rinse, pat dry, and remove leaves from the thyme, rosemary, and parsley stems. Chop well. Crush garlic. Set all aside. 3. Add the remaining olive oil to the heated skillet. Add the onion, and reduce heat to low/medium. Cook until it softens, about 5 minutes. Add the potatoes, and turn the heat to medium/high. 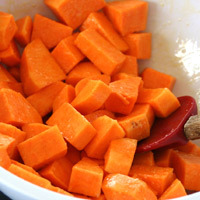 Stir frequently, and cook 2-3 minutes. 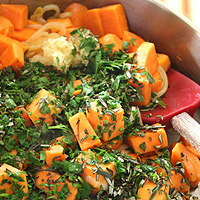 Reduce heat to medium, and add the garlic and fresh herbs. Stir well, and cook 1-2 minutes. 4. Transfer pan to the heated oven. Roast (5)5-15 minutes until the potatoes are softened. 1. The potatoes can sit in a bowl of cold water refrigerated up to one day. 2. Rinsing potatoes removes the excess starch that comes when cutting them. This helps keep the outside crisp instead of mushy while cooking. 3. Drying the potatoes allows the oil to coat them so they won't stick to the pan. 4. A mandolin is the easiest way to get even onion ring slices. I got mine for $10 at Wal-Mart. I've had it for 3 years now and it still works pretty well. 5. The time here varies greatly depending on the size of the cubed potatoes. Other factors are the cooking time and temperature on the stove.